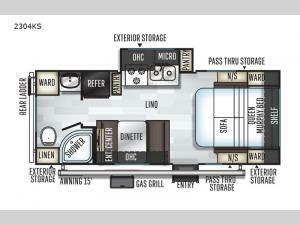 This single slide out Rockwood Mini Lite 2304KS by Forest River is a great travel trailer for a weekend away. In the kitchen area, there is a double door refrigerator and a pantry for your food storage needs while camping. You can hang your clothes in the wardrobe and lay your keys on a nightstand on either side of the Murphy bed. You will love the convenience and added privacy with the rear bath, which has not only a linen closet, but also a wardrobe available for you to keep things neat and tidy. 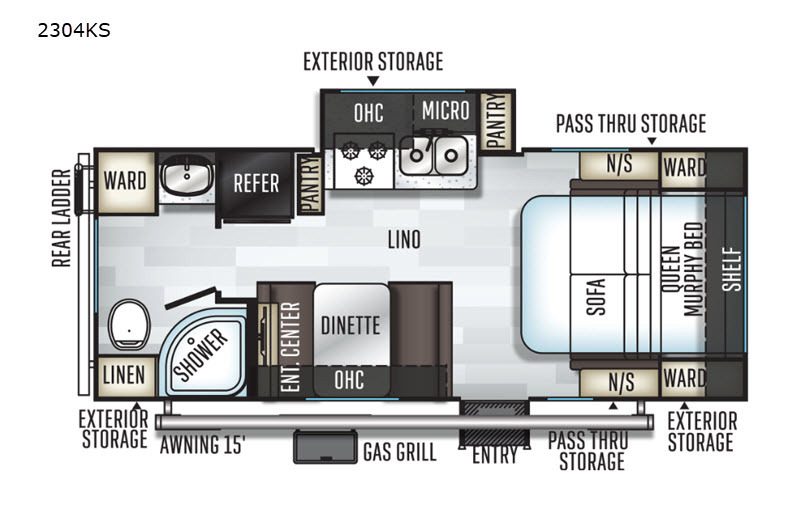 Outside be sure to enjoy the shade from the 15' power awning with LED lights for those late night gatherings, cooking your favorite camp meals on the gas grill, and the pass-through storage compartments, plus additional exterior storage for all of your camping gear.